What is idea paint? 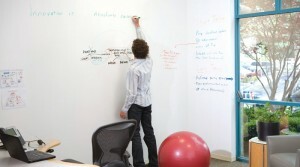 Idea paint is a single layer of paint that is used to produce a very useful dry erase surface. Idea Paint is now a household name because of its usefulness and great results after use. This is a paint that you paint onto your walls and it creates a dry erase surface on your walls. Idea paint comes in three main colors. It may be clear, white or black. This sort of paint should only be applied using a roller, not a brush. Many people use idea paint for different reasons. Mainly, idea paint is used for the ease of cleaning that comes with it. The surface that is produced after using idea paint is one that can just be wiped off easily. Idea paint is globally recognized as the originator of high-performance dry erase paint and is available in a variety of formulas that cater to residential, commercial and educational customers. In the event that you are a part of a household within which there are young children, using idea paint is a good idea. Generally, children enjoy making markings on walls and other flat surfaces and many times, these markings prove to be very difficult to erase. With idea paint, the children can make their marks today and then tomorrow, the surface can be clean again because you can simply wipe off today’s work of art without much effort. Idea paint is also popularly used for educational purposes. The white board that is used in schools is an example of how idea paint can be used for formal education. Students find it fun to use and because of this, many teachers try to incorporate it into their classroom environment, by using it not only as the surface of the board, but also, as the surface of tables and sometimes a specific section of a wall. This can make the lesson more fun as the students are able to be more actively involved, as they will be able to experiment with concepts and make their mistakes, while, still being afforded the opportunity to just erase it and start over.